US crude oil stocks hit their low point on January 19, 2018 and have started to rise again. The amount of crude oil fill has averaged about 365,000 barrels per day since then. At the same time, prices of both Brent and WTI oil have fallen from their high points. Data of the US Energy Information Administration indicates that US oil supply has recently begun to surge. It is not just crude oil production that is higher. Natural gas liquid production is higher as well. 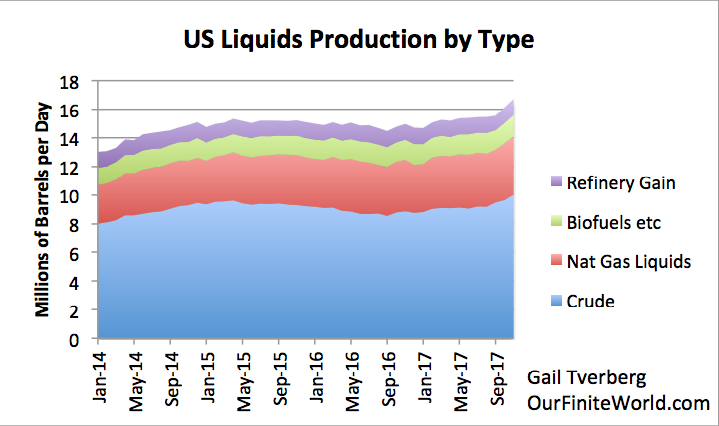 As a result, Total Liquids production is reported to have been more than 16 million barrels per day in November 2017. Total world production, combining the amounts on Figures 2 and 3, set a new record of 99.1 million barrels of oil per day for November 2017, based on EIA data. This level is above the November 2016 level, which was the previous record at 98.9 million barrels per day. The percentage of US residents who can afford to buy a new automobile or light truck seems to be falling over time. 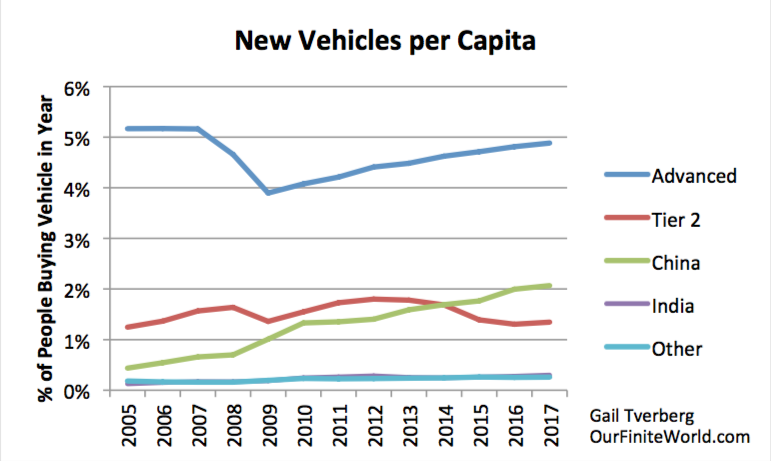 If we look at the number of autos and trucks sold in the US, per 1000 population, we see a pattern of falling humps, as a smaller and smaller share of the population can afford a new car or light truck, each year. The big drops occur during the gray recessionary periods marked on the chart. Part of what is happening is that vehicles are becoming longer-lasting, so that there is not as much need to buy new cars frequently. But having a short-lived, cheap car has an advantage, if it makes cars available to a larger percentage of the total population. With a vehicle, a person has a much better ability to participate in the US workforce. US Labor Force Participation Rates peaked in about the year 2000, which is about the time of the third peak in affordability. 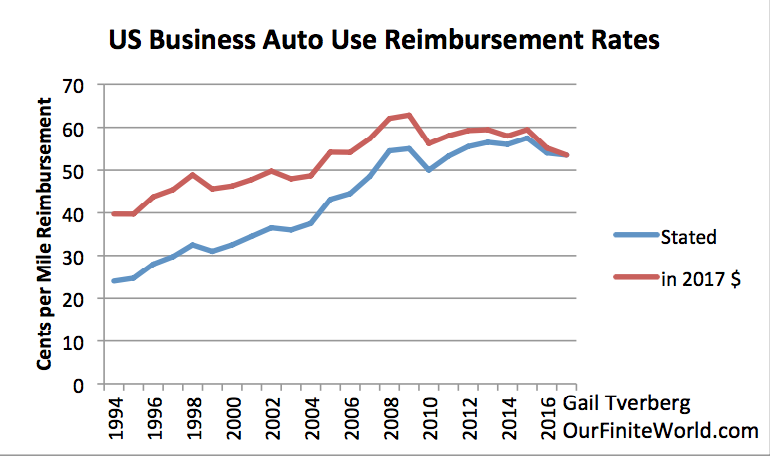 One estimate of the cost of auto ownership is the reimbursement rate that the US government allows businesses to pay workers who use their own cars for company business. Building homes also requires oil. 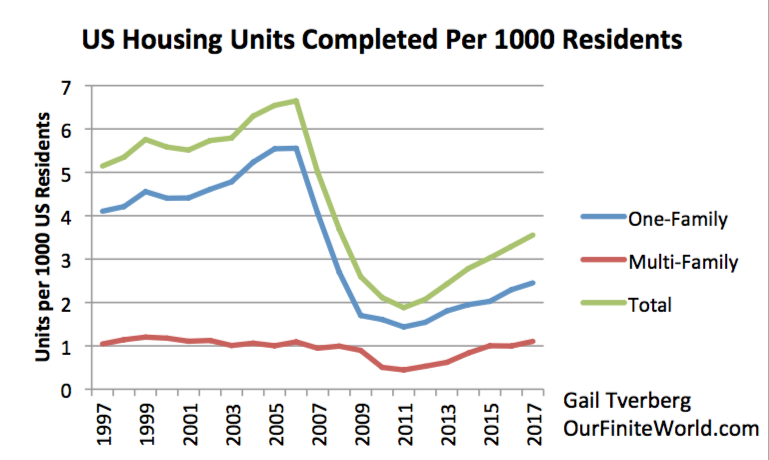 There has been a sharp drop in US home building, both on an absolute basis, and on a per capita basis, since 2008. For this grouping, growth in auto sales is again rising, but has not regained its prior level. This is somewhat similar to the indications in Figure 4, for the US only, looking at cars and light trucks. The main difference is in the last two years. Changes in currency relativities may be helping recent vehicle sales for the other countries in the grouping. Even China’s recent ban on importing certain types of materials for recycling can be expected to have an adverse impact on oil demand. Very often, if a container is sent from China to the US or to Europe, there will be no exported goods to send back to China, except for material for recycling. If China refuses to take recycling, containers will need to be returned empty. Another adverse impact of oil and energy shortages tends to be fighting and wars. The fact that the US seems to be raising its energy production, in apparent disregard for countries that have been trying to cut back, is likely to make some oil exporting countries quite angry. It could sow the seeds for another war. This entry was posted in Financial Implications and tagged oil demand, oil glut, oil prices, oil storage, recycling. Bookmark the permalink. When you see car loans for 60 or 72 month that seems to speak fo the affordability issue you mentioned. I also wonder about the role of electric vehicles. Do they have a future or are they a dead end and a distraction? While lithium for batteries is reusable there is only so much of it. Also, there cost make them affordable to a limited number of people. Maybe we just need to transition to less mobility and more public tranportation. 1. Electricity and the electric grid are very hard to maintain. We are already having difficulty with providing proper grid electricity. Europe was in the news recently because clocks powered by grid electricity now run slow. South Australia is trying to figure out how to provide adequate supply at a reasonable price. Some natuaral gas that was originally intended for export will need to be shipped by boat to the opposite side of Australia, to provide adequate fuel for power plants. 2. Prices of vehicles are very important for affordability. Currently, big subsidies are available, but in the US, these are limited to the first 250,000 vehicles an electric car manufacturer makes. Thus, costs are headed up. Governments cannot afford to pay large subsidies if huge numbers of cars are sold. 3. International trade is very important in making electric vehicles, because of all the imported materials used. Keeping international trade up will be a major challenge. For example, cobalt is used in making batteries. Congo needs higher prices on its exports, if it is to collect adequate taxes to support its economy. Since it is the world‘s largest supplier, it can pretty much set the prices it wants. Countries that collapse from lack of tax revenue are impossible to do trade with. 4. Many other challenges, including possible materials shortages, if electric vehicle manufacturing is to be ramped up to a level where it makes a difference. in other words, people will be transitioning to more poverty. How about horses? They also provide excellent fertility for the veg garden and go a long way towards feeding the soil critters and mycorrhizal fungi vital for soil fertility and health. Problem is we might need to get rid of a lot of people first as we will need the land to keep them on, especially here in the UK (we seem to be embarking on a house building boom, it’s the only industry we have left, apart from funny money in ‘The City’. No doubt FE will point out they will be culled by the hungry hordes for food. FE can I recommend a book ‘The little Ice Age’ by Brian Fagan it’s right up your street. Read it along with John L Casey’s ‘Dark Winter’. Excellent article Gail, many thanks. Did I tell you my neighbour has a few large cows as pets on their property? And lots of red wine…. As long as we don’t need roads or tracks for the public transportation, we are OK. It is keeping up the infrastructure that sits in place that is impossible. Infrastructure/capital is an incredible liability for future energy (and of course money). I own an engineering consulting company. I have never once seen a client – private or public- no matter how wealthy – who has budgeted for adequate capital maintenance. Even most homeowners don’t realize that to keep your house from collapsing into garbage ultimately takes up to 4% of the value of the home per year to avoid reliance on refinancing for major events. At nearly $400k for a new amount that is as much as $16,000 per year, on top of a probable current mortgage of $20k or more per year it is no wonder that people have trouble – and tend to hop around a lot. This “hopping around” allows house “flippers” to use new debt to tackle differed maintenance and prop up the value of homes. That is a good way of describing the situation. I know that we made the mistake of finishing our basement, even though it wasn’t 100% dry. This has been a headache. We sort of have the problem fixed now, but it depends on pumps and electricity. If the problem isn’t the basement, it is the exterior. The roof and paint need to be updated fairly often. Our part of the country is subject to termites, so we need to take action to prevent termites, and have the termite inspector make annual inspections. There are all kinds of things that seem to break regularly. Sump pumps need to be replaced fairly often, for example. Without replacement parts, the expected lives of our homes are pretty low, especially in the South, with termites. As the Romans found: first they built lots of new infrastructure to deal with insecurity, and then later in many places they had to shrink their fortresses, so by the end of Empire the soldiers were living in just a corner of the old walls. The barbarians who came along then lived in that little part themselves until it fell down. Static and expensive infrastructure imposed on the environment is one of the reasons why complex civilizations must fail,…..
Another great analysis and commentary, Gail. What continues to amaze me is the number of people who look at the exact same ‘facts’ and have an almost diametrically-opposed interpretation, especially those who dismiss resource limits completely and argue that human ingenuity and technology will eliminate the dilemmas we seem to face. One thing that is not obvious is that increased technology leads to wage disparity, because some workers are needed with advanced education. Providing everyone with advanced education does not fix this problem, because the economy only needs a limited number with advanced training. My guess is that unsaleable US extra light tight oil may again be filling US inventories as export markets have only limited use of tight oil (as blending component). Art Berman has just calculated that 88% of US crude exports are rather heavy ie. less than 35 API. “Will US shale give the refining industry indigestion? 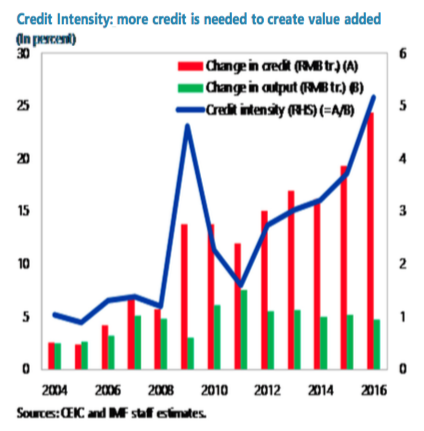 Low wages growth and other economic weaknesses are the result of debt incurred during the high oil price period following the first crude oil peak in 2005. On your solar analysis, your hypothetical without solar uses a whole lot more hydro. Is this hydro really available, but not being used? It seems like hydro would remain pretty much the same. It would be coal and gas that would be reduced. Anyway, my question is, or suggestion, that in addition to the larger economic picture diminishing demand for fuels (in the U.S.) that you picture, this tight oil/refinery mismatch is at least partly responsible for inventory builds? As I understand it, we are importing heavier oils to blend with lighter tight oil, before it goes to the refineries. What price are the refiners paying for this (less useful?) tight oil? Below WTI? If this mismatch story is correct, it makes me wonder how much of the tight oil production in the U.S. can be refined in the U.S., without imported heavier oil. In general, the effort to blend light and heavier oils from different geographic locations feels like an example of the ever growing complexity and cost to delivery refined fuels. We have an awfully lot of refinery space worldwide. The decline of the North Sea has left a lot of underutilized refineries in Europe. China and India have been building refineries. Saudi Arabia has been building refineries for its oil. I know that at least some “simple” refinery space in the US was closed, because refiners couldn’t make an adequate profit refining light oil. Part of the problem was the Brent-WTI differential. (WTI, even now, sells for a little over $3 per barrel less than Brent.) These were East Coast refineries that were buying African oil at prices based on Brent. They couldn’t compete with refineries buying oil priced based on WTI. Also, heavier oil gave a better product mix, and the possibility of profits for cracking long molecules into shorter ones. I really don’t know whether the light oil mismatch is responsible for the inventory build. My impression is that it is not. There is usually a demand for oil of various grades, at some price. (For shorter chains, such as ethane, some does get burned as if it were natural gas, if there is too much.) Refineries are always looking for ways that they can operate their refinery in the most cost efficient manner possible. In some cases, this means blending a heavy oil with a light oil. I think that that is what some of the tight oil is being exported for, right now. Thanks! I know that the reason why those doing the extraction wanted to ship oil overseas was to get better prices from refineries. The WTI/Brent differential has been going on for a long time–it looks like since about 2011. Oil producers in this country did not like getting a lower price for their oil than they would if they sold it to overseas refiners. 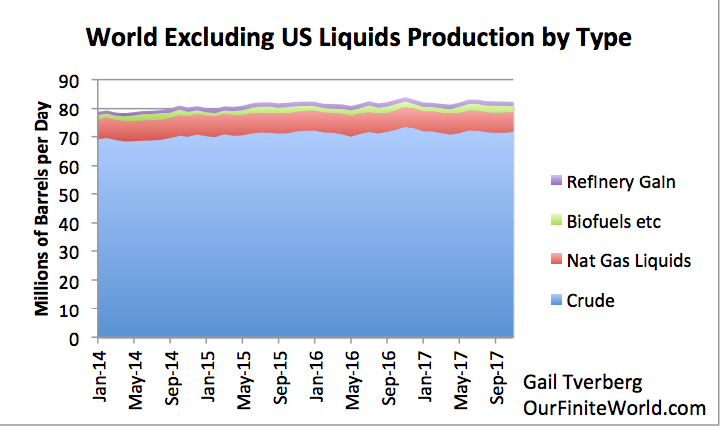 US refinery space tend to be close to fully utilized. It does not pay very high prices for the oil it buys, because it already has plenty of oil coming its direction. Refinery space elsewhere tends to be less fully utilized, and pays higher prices. I don’t know the details of what is being sold where now. But the changes do seem to be getting rid of the big differential. I think the key thing that most people do not understand (you excluded Ms Tverberg, I’m sure you do) is the extent of speculation in our economy. Speculation being narrowly defined here as the purchase of something with the hope that someone will purchase it from you at a higher price some time in the future. While cars and light trucks are not bought on that basis (barring collectibles), houses, much of real estate, and common stocks generally are, and they provide for much of the “growth” in our economy. This “growth” is the foundation for much of the remaining economic activity, not only in the West, but in the export economies of Asia. 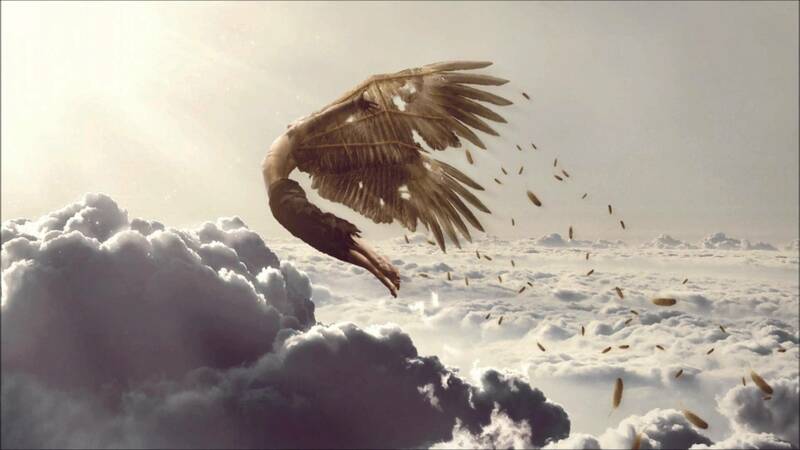 Vast amounts on the balance sheets of America and the world are supported by this speculation. Take this speculative aspect out of our economies and they collapse under the weight of these overvalued balance sheets. Great stuff as ever, Gail. Right! Higher interest rates make things less affordable. CPI data does not take into account interest rate changes. Economists have generally ignored interest rates, considering interest simply payment from one entity to another. Our data doesn’t really give us a good idea of what is happening. Great piece like always! I am around median earner, but have kids and unemployed wife and I cannot afford a car. Before high rents were taking taking half of the income after taxes. Now we own a share in goverment supported housing and pay lower payment, but need still to pay away the loan we took to pay the share. I see how other median earners are in need to squeeze the penny to be able to afford a car, and without goverment schemes, like that you can reduce the gasoline costs in taxes, what go over a special limit was it 700€ a year many would struggle even more. In order to boost transfer to less emission cars(people have older cars, due high taxes and affortability issues) you can at the moment get scrabbing money from your old car (1000€). Just heard how high earning co-worker had bought an used car from Germany, and that for a guy who is a car enthustiastic, got no kids and has well earning woman to share the costs. There is little public transport in places where the population is very spread out, simply because it is difficult to find an economic way to get people to where they want to go, when there is little population density. We have this difficulty in much of the US and Canada. The Atlanta area was most set up after cars became common, so businesses were placed in many areas around the city, rather than around the city. Public transport is limited. I had an administrative assistant who lived in Atlanta and took a bus to work. Whenever she needed to work late, she needed someone to drive her home, because bus services was not available then. For her, Sundays were a problem for doing anything at all, because no bus service operates on Sunday. My son takes a bus to his job in downtown Atlanta on weekdays. We need to drive him three miles to the bus stop. The other option would be for him to walk back and forth to the bus stop (besides walking from the bus stop to his office downtown). He can’t work late, and he can’t work on Saturdays, given the bus schedule. This limits the jobs he can take. (He doesn’t drive.) Another option would be for him to get an apartment near the Express Bus stop, but that adds a different set of complexities. A few have solved this problem in Los Angeles by living downtown. When I was single, I lived near downtown. It is not as easy for an autistic adult, like my son, who is not 100% up to living on his own. As someone born in LA in the 1940’s, one can live in LA without a auto. I’m currently in Bend Oregon, and it is a suburban nightmare. You need a car just to keep a bit of sanity. and foodshops were one of the main decision factors in our situation and for contigency we choose a place what has train and bus connections to capital area. My older childrens live with their mother in a place where there is little connections so they are most of the year stuck in their small village area. Definetly our situation will lead to re-emergency of a local human. are you willing to tell us where you live? 50 Plus Charts of doom. The US cannot compete in the global economy. It’s a fake economy. I love that second graph! only their QE is keeping them afloat. You love seeing other counties economies tank? That is sorta sadistic don’t you think? but you also like living in a “fake economy”, right? or do you really prefer hard labor? To me any economy that uses debt is a fake economy. The only real economy is hunter-gatherer lifestyles. Even hunter-gatherer lifestyles had promises to support economies of scale. They weren’t debt, per se, but they were promises that allowed specialization (hunting, gathering, tool making, gathering of flints). There were social rules that guaranteed that people who specialized would still come out well in the sharing process.